Angelfish Cay condominiums have the best of both worlds. They offer a wonderful waterfront view and have a community pool within walking distance from your front door. Parking areas for cars and golf cart charging area. Dockage is upon availability for 28 and smaller boats. Conveniently located across from the Health and Tennis Club and Racquet Club. You are just a short cart ride away from Buccaneer Island, Fishing Village and the golf courses. Gorgeous Bimini Bay Resort Condos and dockage for rent. Each condo property has a 16% tax and $70.00 cleaning fee as well as a $8/per person per day resort fee. Creekhouse pool is one of the largest pool in all of the associations on the reef looking onto the ocean and bay. Sunrises and sunsets are to be enjoyed at Creekhouse one of the tallest building in Ocean Reef. Enjoy internet access, quiet and friendly neighbors while sitting on your screened in patio for coffee or afternoon tea. Fairway Lakes Condos are located on Dolphin Course offering lovely views onto the golf course and walking distance to the club and shopping. Many of our homes are designed with the family in mind. Including large living and dining areas, split bedroom arrangements. All properties include high quality furnishings and attention to detail with fresh linens, fully equipped kitchen, cable television, internet access, hot tub and/or pool. The Villa Section of Ocean Reef special closeness to the clubs restaurants, Buccaneer Island lagoon and pools. 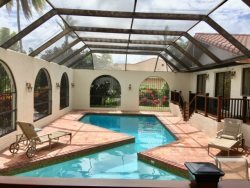 Reef Rentals, LLC offers a variety of waterfront condos around Ocean Reef. Some have elevator access, dockage upon availability, internet access, and community pool.